Gardening in Spain Rose Pruning. Rose Pruning Winter time is the correct time to prune those roses in your garden. While there is a great deal of disagreement among rose experts regarding how and when to prune roses, it is generally agreed that most mistakes will grow out very quickly. Winter time is the correct time to prune those roses in your garden. While there is a great deal of disagreement among rose experts regarding how and when to prune roses, it is generally agreed that most mistakes will grow out very quickly and it is better to make a good effort at pruning roses than to let them grow rampant. Just remember that first and foremost, the goal of all pruning is to help the plant provide new growth and to keep it healthy by making it possible for air and light to filter into the middle of the bush. As you are guided by these two principles, you will find that pruning roses is fairly common sense and not nearly as complex as you once may have thought. In our climate roses rarely go into a full dormancy or completely lose their leaves, but with the exception of ramblers, most roses can be pruned during late winter when growth is just resuming. Clear away grass and leaves, anything that might harbour insects and diseases. Use sharp secateurs and, for larger stems, loppers or a pruning saw. Make all cuts clean. Start by cutting out all dead wood and all canes that are diseased or damaged. Any canes that are old and striated (showing deep furrows) also need to be removed. Open the bush up by removing all branches that cross through the center. Cut out very thin canes, and remove any branches that cross or rub together. 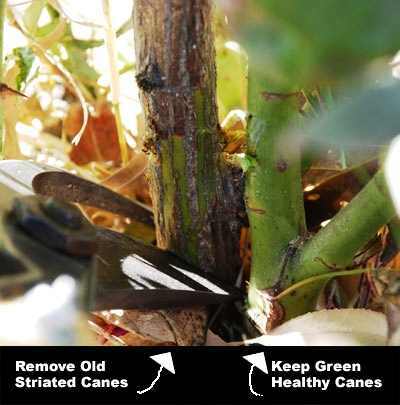 Remove new canes growing out of an old, striated cane. Keep only new green canes that are growing out of the bud union. When removing an entire cane, make the cut as close as you can to the bud union. These are long, slender, flexible canes that originate from below the bud union. Trace suckers back to the roots from which they grow and pull them away. If you just cut it off, any undeveloped growth eyes left at the sucker’s base will just produce more suckers in the future. Moderate prune: Cut back the stems that are left to one third their length, this is considered a moderate prune. 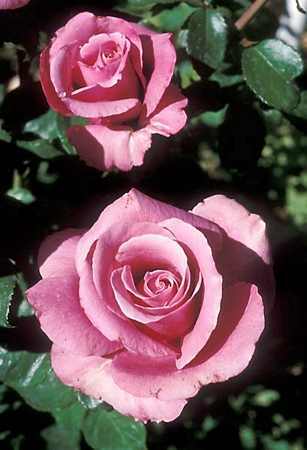 A moderate prune is what is recommended for nearly all established bush and standard roses in regular soil. 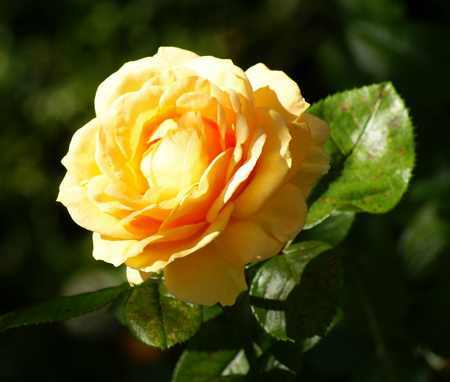 Hard prune: With the exception of climbing roses, prune all newly planted roses hard (so that only 3 or 4 buds are left from the base of the plant) to encourage vigorous shoots. 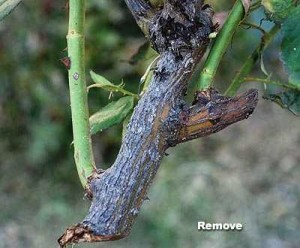 Hard pruning can rejuvenate old and neglected roses, but you are generally better off with moderate pruning. Cut to an outward-facing bud to encourage an open centre. With roses of spreading habit prune some stems to inward-facing buds to encourage more upright growth. Always prune to a healthy bud and cut just above the bud. Cuts should be no more than 5mm (0.25in) above a bud and should slope away from it. If you cut it too closely, the bud will be damaged, if you cut too far away, you can have die back and possible disease. If it is brown, cut back further until the plant tissue is white and healthy. Your goal is to have an open-centered bush with only healthy stems when you are done. Paint all cuts with a sealing compound to protect the plant against diseases and pests. Painting the cuts takes just a few minutes. You are done! In the spring when the plants begin to break dormancy, give them some fertilizer to help them get ready to flower. If you think the above sounds too complicated, you can opt for the easy-care method. Simply cut the bush in half, straight across with a hedge trimmer. Job done. Nothing more complicated than that. Leave all wood, but if you wish you can cut out all dead wood. Interestingly enough, experts that have experimented with both the moderate and easy care trimming method, report that there are no noticeable differences later on in the growth and bloom of the bush. So do not be afraid to prune – just go ahead and start to experiment. You will be rewarded with your own valuable experience and a bounty of sweet smelling roses! Always use a professional if you have the need to fell any large trees. Tree Surgeons are more than people who cut trees, they are skilled craftsmen with years of experience. 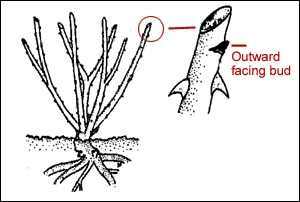 This is an easy-to-follow manual for successful pruning without stress, from basic principles to more advanced techniques. It features specific pruning guidance for every type of plant, including floribunda roses, shrub roses, climbing roses, clematis, honeysuckle, wisteria, pyracantha, hedges, fruit trees, espaliers, cordons and soft fruit bushes. It explains cutting back to the ground, deadheading and shaping with shears, restraining evergreens, shortening new growth and rejuvenating neglected plants. It contains an illustrated guide to specialist tools and equipment, such as pruning shears, loppers, pruning knives, saws, hedge shears and hedge trimmers. It includes a useful checklist of the most popular shrubs, with advice on the pruning techniques suited to each. It features 50 step-by-step techniques and pruning projects, with over 370 clear and informative photographs. As well as being important for plant health, pruning can be a very therapeutic and enjoyable task, and this beautifully illustrated book provides expert advice to help you tackle the job with confidence and satisfaction. All the key rules of pruning are explained in a clear way, to ensure successful results throughout the year. After a section on equipment, the basic techniques are set out in detail – including deadheading, shaping and trimming – each appropriate to a variety of plants and situations. All the most popular plants are covered, such as roses, clematis, hedges and fruit bushes. There is also a cross-reference checklist which provides a handy guide to the pruning techniques suited to each type of shrub. 46,51,9,36,43,photo size 50,3, rose pruning. Gardening in Spain Rose Pruning Winter time is the correct time to prune those roses in your garden.